Allegations: That on March 6, 1918, while waiting for breakfast in the lobby of the Pollard Hotel in Red Lodge, said to proprietor Thomas F. Pollard, "This is a rich man's war and we have no business in it; they talk about Hooverism--it's a joke. Nobody pays any attention to it. It don't amount to anything; The Lusitania was warned not to sail. They were carrying munitions and wheat over to the Allies. The poor man has no show in this war. The soldiers are fighting the battles of the rich." Case Details: Pollard, chairman of Carbon County council of defense, swore out a warrant before lunchtime. 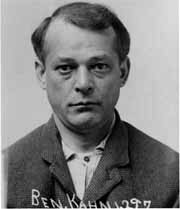 Convicted after trial April 15-16, 1918. Judge instructed jury they could find only on third of 4 counts in information, of using "seditious language calculated to incite and inflame resistance to the administration of the federal food laws and regulations and Herbert Hoover, Federal Food Administrator." Served 34 months in prison. Played in the prison band, including in Deer Lodge City Armistice Day Parades in 1919 and 1920, and the American Legion parade. Worked as outside trusty, handling all freight and shipping matters, powder and dynamite caps for the road crews, and issuing clothing Conviction appealed on constitutional grounds. State supreme court affirmed on 5/20/19, 56 Mont 108; 182 Pac. 107 (1918) #4267. Pardon petition endorsed by govs of Washington and Utah, businessmen in Washington, former employers who praised his patriotic generosity to the war effort, and by the Jewish community. Sentence commuted by Lt. Gov. W.W. McDowell to 5-20 years for immediate parole. Paroled Feb. 6, 1921. Personal Information: Born in New York City. Raised in St. Joseph, Mo. for 17 years. Worked in Seattle 3-4 years as a diamond salesman. Worked as a salesman for Standard Furniture Co. in Great Falls, Rosenblatt Bros. in San Francisco and for Sierra Campo Wine & Brandy Co., San Francisco at time of arrest. Based in Billings, territory Montana and Wyoming. Father Aaron in Jewish Home for the Aged of the Northwest in St. Paul was at least 89 in 1918. After prison, worked in Alaska, then married, had one son and settled in Ohio. Operated a general store. Died in Medina, Ohio, in mid-50s. Family in Ohio and Florida.